Gorgeous beach front ocean villa in La Capilla on one of the East Cape's most scenic beaches. Try your hand at light tackle and fly fishing, snorkeling, diving, kayaking, and paddle boarding from right in front of your unit. Whether relaxing on the patio or roof with a tropical drink whale watching, or adventuring out , you decide what to do and when. This truly is a paradise awaiting your arrival. Located 36 miles directly north of SJD(San Jose del Cabo, BCS) between the coastal villages of La Ribera to the south and Los Barilles to the north. toilet, combination tub/shower, master bath double sinks. This is not the first time we have stayed at Alex's and most certainly won't be our last. Not only is her place the absolute best in the area (and we have stayed in many), her place is sparkling clean, lots of little touches to make our stay incredibly comfortable . The towels are thick, the sheets soft, the kitchen incredibly well equipped, and the location just does not get any better...away from the noise and crowds of Los Barilles, but a quick 10-12 minute drive to town. And its on the most beautiful beach for swimming in the area. The best part is that Alex and Brad are right there if you need them, but give you your absolute privacy. There are also 2 other "casas" in the same house, another 2 bedroom at the back with an incredible rooftop tanning/whale watching roof space, and a quaint little one bedroom my husband and I have enjoyed many times for the ultimate quiet and privacy. It has a view down an empty beach and of the desert..great bird watching:) I was reluctant to write this review because we've always felt it's a well kept secret, but Alex and Brad work hard and deserve to have their place full. You'll just keep coming back! Casa Laguna is perfect in every sense. You are on a secluded stretch of beach that’s an easy 45 minute drive from the SJD airport. The house itself is appointed to perfection, from soft sheets and fluffy towels to cold bottled water in the fridge and 50SPF sunscreen in the pantry. The fully equipped gourmet kitchen is every cooks dream. Alex is the most gracious host I have ever encountered, she made sure we knew exactly how to get to Casa Laguna and was available to answer every question. There was a lovely welcome amenity of chips and salsa to set the tone for a perfect stay. The beach is quiet and safe to swim. There are kayaks and floating mattresses available to enjoy quiet days on the beach. Boardgames and books offer hours of leisure during unplugged afternoons and US Dish TV and convenient WIFI are available to get your outside world fix in this perfect beach getaway. Without a doubt Casa Laguna is my favorite place for a fun and rewarding beach getaway. We’ve been to the East Cape region several times, and have stayed in rental houses wach time, but this was by far our favorite. Alex was an incredibly gracious and welcoming host. The house was beautiful and well-stocked. The beach is the best in the area. We will be returning for sure. Beautiful ocean view with a wonderful caring host! Outstanding waves in summer for her kayak. Miles of perfect sand and close to Los Barriles, Cabo Pulmo and other wonderful towns. Do not miss El Triunfo 45 minute drive. Dine at Bar El Minero and enjoy their Sunday paella listening to great music. The best slice of southern Baja is at Casa Laguna! We have spent several years visiting southern Baja and have always chosen Casa Laguna as our home away from home. The location is on a quiet, secluded beach where you can enjoy walks, fly fishing, lounging, and the amazing sunrises and sunsets! It is a perfect location for families, couples, and single travellers. The unit is stocked with everything you need to enjoy your stay and feel at home, including a large kitchen, an open indoor and outdoor living area, 2 comfortable bedrooms, and 2 full bathrooms. Alex is always very welcoming and generous to ensure her guests enjoy their stay and experience. Los Barriles is the nearest town that is about a 10 minute drive where you will find all the amenities you need as well as a variety of restaurants and shops. Do yourself a favour and stay here so you don't miss out on an amazing experience in southern Baja! Absolutely beautiful. The home was spotless and beautiful. We had fresh chips and guacamole and a nice bottle of wine to welcome us to this piece of paradise. Two couples enjoyed the home, hospitality, and great walks on the pristine beach. 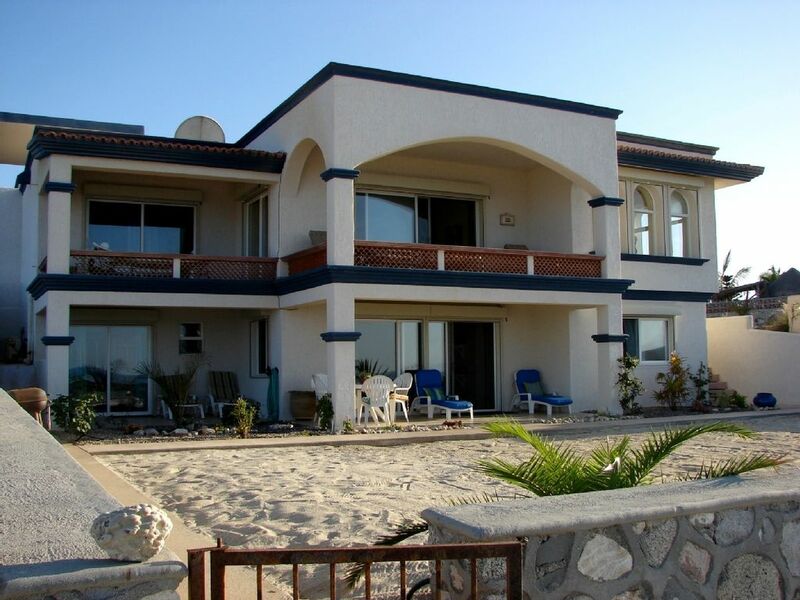 Beach Front Ocean Villa in La Capilla on the Sea of Cortez in the East Cape Region of Baja located 5 miles South of Los Barriles. Endless unobstructed beach views. Private enclosed beach area on one of the East Capes' most scenic beaches for sport fishing,fly fishing, swimming, snorkeling, kayaking, kite boarding, wind surfing, diving, horseback riding, etc.